A small Chinese startup says it's about to unveil a smartphone that can bend all the way around your wrist. 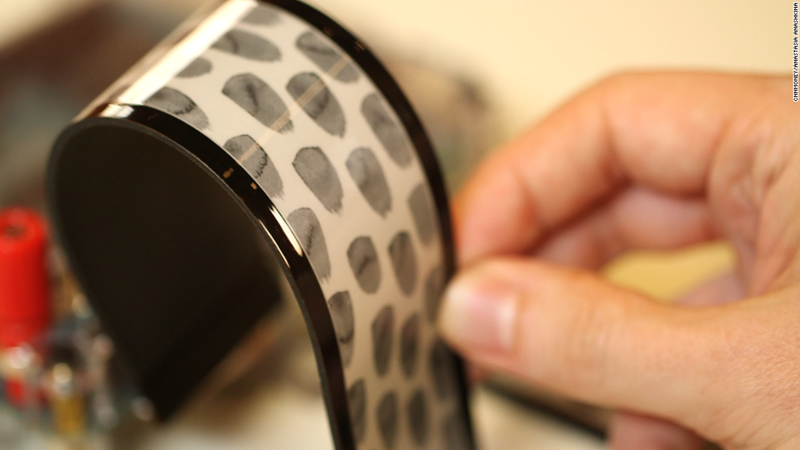 The bendy screen uses graphene, the thinnest material in the world that's also strong, light, transparent and flexible. Moxi says it has already produced a prototype of the phone and plans to put 100,000 units on sale in China by the end of this year. It's an impressive feat of innovation if it pulls it off -- no other company is known to have brought a fully bendable smartphone to market. But there's a catch: the phones it intends to release initially will only have black-and-white displays. The company says it's aiming for a full color version, which is more technically challenging to make, by 2018. 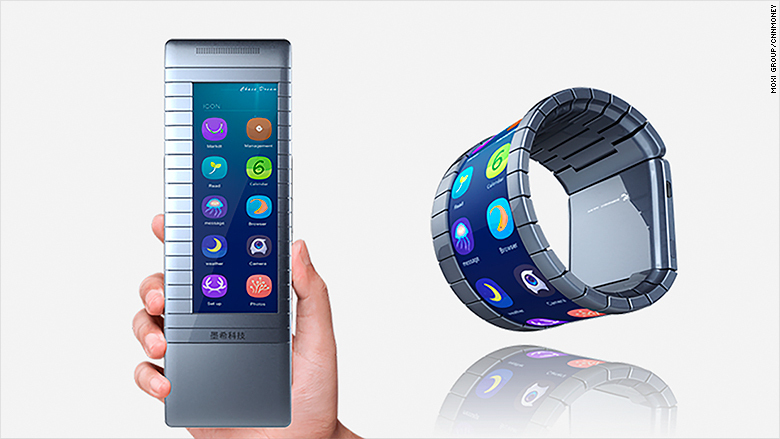 A mockup of a bendable smartphone designed by the Chinese startup Moxi. The company plans to start selling black-and-white versions of the device this year, but a full-color model isn't expected until 2018. The black-and-white phones are expected to sell for around 5,000 yuan ($760) each in China. The cheapest version of Apple's iPhone 6S retails for 5,288 yuan (US$806). Moxi, which is based in the city of Chongqing and specializes in graphene, released some regular smartphones last year using the material. The company's name -- pronounced "mou-she" -- is short for "graphene" in Chinese. Giant tech companies like Samsung (SSNLF) and LG (LPL) have also been working on flexible touchscreens and developing products using graphene, according to Nicole Peng, an analyst at the tech research firm Canalys. Samsung has already tried curved screens that wrap around the device from the front to the sides. LG has its "Flex" phones, which are nearly curved to the shape of your head. They bend a bit, but nowhere near as much as Moxi claims its phone does. Apple, meanwhile, received a patent for a "flexible electronic device" last year. The filing showed two dozen drawings of how a device could be warped. The challenge for companies is to figure out if it makes "commercial sense to build this product for the mass market," Peng said. Wearable technology generally doesn't yet have the full capability of a regular smartphone, she said, and customers are going to want a device with greater computing power and lots of functions.